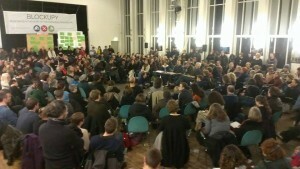 Re-thinking and re-launching Blockupy International in times of multiple crises? What does that mean + how to go on? as Blockupy International we worked for the past years to create a transnational, European wide mobilization and space of praxis against the EU crisis regime, against the European wide imposition of austerity politics as well as against the deep anti-democratic character of an EU-in-crisis. In these years Blockupy could evolve as one space for connecting various struggles and political actors, subjectivities and localities for a struggle for a Europe from below. We organized meaningful European wide days of action but more importantly brought these struggles into the “heart of the European crisis regime and financial power” – to the ECB and the financial district of Frankfurt. We connected strategies of broad alliance building and confrontation, a praxis with larger political orientation, linked European wide, transnational dynamics with “the local” and “uneven”. March 18th in Frankfurt had been a highlight for that process – a highlight within and for a larger political process in Europe. And for sure, many of us throughout Europe and beyond Blockupy agree on the strength of this kind of common transnational anti-austerity mobilizations. To continue after March 18th was therefore approved – however, maybe with a different target (e.g. the German government in Berlin). The European spring and summer of the “Greek OXI” articulated furthermore the chance and political necessity to keep going – turning the struggles in Greece once again into a European struggle of democracy and for social rights from below. Consequently, Blockupy International convened in early July and decided on our next steps forward: The upcoming EU Council summit in mid-October was identified as one crucial next moment and milestone of such common demonstrative instance. Moreover, the idea to target one of the major headquarters of power – the German government in Berlin – in spring 2016 seemed a further point of transnational and German mobilization (for the outcomes of that meeting see: https://blockupy.org/en/6184/report-on-the-meeting-of-blockupy-international-coordinating-group-taking-a-new-step/). However, since early July the situation and dynamics in Europe have changed dramatically and we are at a crossroad right now. Therefore, as Blockupy International, we need to reflect on this situation and relate that to our ongoing work and plans, to the political process of Blockupy International and the challenges we are facing. With July 13th – the blackmail against the Greek struggles and the “Coup” that resulted in Syriza’s signing a third memorandum with the Eurogroup – a process of radical reflection on the im/possibilities and paths towards radical change within, through and against the EU gained special momentum. How to understand the implications of July 13th – and what consequences to draw for the transnational anti-austerity struggles in Europe – is an open question right now. also recognized the “blackmail” and the “Coup” as such but tried to focus on the potentials in building new spaces of an “oppositional block” against this Europe from above beyond Blockupy itself (see: https://blockupy.org/en/6174/lets-raise-our-european-oxi-from-athens-to-brussels-and-berlin-our-no-is-everywhere-in-the-squares/). However, “Europeanizing the OXI” as a common dynamic seems to be halted at the moment – including the Blockupy International work. Of course, struggles against austerity and for dignity, for new political forms and radical practices – be it in Spain or the UK, in Rome or Athens – have not stopped. History is not over! However, there seems to be deep frustration and confusion on where to go and find meaningful common projects and strategies. Simultaneously, this summer also saw new, strong, dynamic, transnational struggles for a “Europe from below” with unprecedented and disordered movements of migrants and refugees, powerfully challening the EU institutions and destabilizing it’s order. It is a struggle and practice against the EU’s border regime pushing from “outside” as well as from “inside” of Europe. It is a struggle that disobeys borders, a struggle for equality and rights, solidarity and dignity for all. However, how to link these – once again – uneven dynamics and practices, the multiple processes of EU-in-crisis (austerity and border regime), nationalist responses and EU regimes in a politically meaningful way to allows Blockupy International to evolve further and strengthen its potentials for intervention and building broad alliances remains an open question. In light of these past months we seriously need to re-consider where that leads us? Do we need to reframe our attempt to Europeanize the OXI? Do we need to think about new alliances and a re- launching of new networking processes right now? And what for, what could be steps and projects to lead the process of forming common moments against the “EU from above” and for connecting productively the (uneven) struggle for a “Europe from below”? More specifically what role can and should Blockupy International play in this – in terms of practical projects to be developed and in terms of our contribution to larger transnational European alliance processes? And how can we think of this in concrete terms, steps, moment, shared responsibilities? We invite you to the meeting of the Blockupy International coordinating group in Brussels to take stock and deepen the analysis of the situation, to reconsider our strategy – including the question of whether and how to re-launch our process – and to assess the working of Blockupy International. A specific agenda for the meeting will be prepared. We invite all of you who have been active in the coordinating efforts of Blockupy International so far (and maybe slowed your participation), we invite you, who are in Brussels for the days of action and are interested in taking part in shaping the Blockupy International process and potentials of political interventions. If you want to participate please write to international@blockupy-frankfurt.org or send an email to the mailing list: wg-international@blockupy-frankfurt.info. We hope for an engaged, dynamic discussion and for the possibility to re-launch the political and work process of Blockupy. Unfortunately there are no possibilities for (financial) support. If there are any question in regards to the days in Brussels itself – the assemblies, activities of civil disobedience on Oct 15th, and the big demonstration on Oct. 17th (including some logistical questions), please visit http://www.ox15.eu/en/actions.